ENUGU- FORMER governor of old Anambra state, Senator Jim Nwobodo has returned to the Peoples Democratic Party, PDP, citing the dire need for an Igbo to become Nigerian president in 2023 as one of his reasons for the volt face. Nwobodo also said he was convinced that his former political party, the All Progressives Congress, APC, will not win the February 16 presidential election. Nwobodo defected back to the PDP that he was part of the founding fathers, on Friday, in his country home, Amaechi-Awkwunanuw, Enugu South local government area, in mist of major political gladiators in the South east, who came and pleaded with him to abandon the APC. 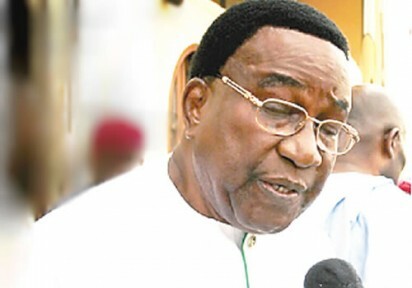 Senator Nwobodo equally stated that he had considered himself more of a statesman than a partisan politician, but because the PDP has offered the Igbo a window of assuming Nigerian presidency in 2023 through the extension of the vice presidential ticket to Mr. Peter Obi, he was convinced to return to the party he was part of its formation. Those who came to urge Nwobodo to return to the party included the former minister of state for aviation, Chief Dubem Onyia, former chairman of the Police Service Commission, Chief S.N Okeke; former Minister for Health, Prof. ABC Nwosu; former secretary to the government of Abia state, Chief Eme Okoro; former SSG of Amanbra state, Chief Osaeloka Obaze; former Presidential Adviser, Senator Ben Obi, Ms Chidi Ekwueme, among others. Responding to their demands for him to return to the party, Nwobodo said “When we formed PDP was in Kirikiri Prison, along with Alex Ekwueme and Bisi Akande my cell mate. Nigerian politicians forget history. At this stage of my life I am an elder statesman than a partisan politician. I’ve served Nigeria in state and federal level with fair share of ups and downs and I’ve made mistakes. “Experience on issues confronting Nigeria, the economy, insecurity and dichotomy; between tribe and arms of government- these three are symptoms or deep rooted issues that must be discussed. “As democrats we must tell the president the truth. I know how difficult it is to know true situation of things. Crisis evolves easily as APC member and as a democrat I was concerned as my fellow members boasted that the 2019 election was as good as won – I wondered how. “The ongoing attempt to rusticate and desecrate the judiciary by arresting the CJN is dangerous; I can’t be part of it, President Muhammadu Buhari must stop this desecration and respect the rule of law. No genuine investor will come to a country where the judiciary is made fun of . My expectation is to be hopeful for our people, the disparity of former leaders will not be the way to groom and mentor the young. “On the return to democracy in 1999, I was one of the founding fathers of PDP, we agreed on rotation between north and south to strike a balance. Obasanjo took first shot and handed to Yar’Adua, followed by Jonathan. Of the three southern zone only the SE is yet to produce a president. It’s been our hope that Nigerians will rally in support a president emerging from the SE. “I had hoped that the route to Igbo presidency would be via APC but comments by top APC officials are not encouraging. Igbo and PDP leaders approached me to return, some of you are part of Ohanaeze – it’s difficult for me to ignore such calls. That Atiku named an Igbo man his VP candidate means I can’t stay away. We will now go to the next level after the VP slot.